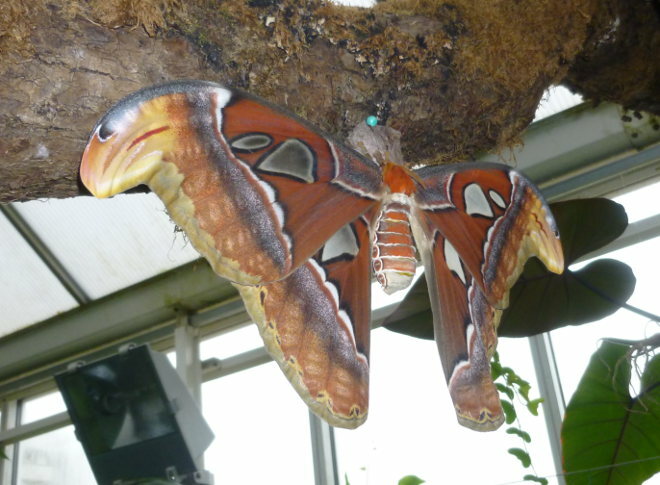 I encountered this rather exceptional Atlas Moth in the Butterfly House at the National Botanic Garden of Wales. It’s not only his snakehead markings on each wing that are impressive. This beauty is the female, with a wingspan of more than 25cm (9.8in). I asked a horticulturalist what they eat, and he told me they don’t. After metamorphosis they’re re-born without mouthparts, with their only motivator the drive to mate and reproduce in their five-day lifespan. January seems the perfect time for a metamorphic tale. This week imagine your protagonist has been a joyful glutton, feasting their way through their youth until strange urge to tuck up and sleep takes them over. After a series of strange and painful dreams they wake to find themselves transformed, sans mouth and an overwhelming desire to fly, seduce and procreate. Not a bad premise for a Kafka-esque nightmare! This entry was posted in Writing prompts and tagged creative ideas, inspiration for writers, story ideas, writing inspiration by Judy. Bookmark the permalink.